The source of the problem in India-China relations is not Tibet. The problem is rooted essentially in how China perceives Tibet. China’s flawed perception on Tibet both colors and distorts its relationship with India. For India, the intractable border dispute is the primary issue inhibiting closer ties. But for China, Tibet is the determining issue, and it perceives India’s giving refuge to exiled Tibetans as an anti-China policy. India is home to some 120,000 Tibetans who have fled China on foot, making the hazardous journey through the hostile mountainous terrain. Tibetans are still transiting to India, but their numbers have considerably declined post-2008 from nearly 2,000 to few hundreds every year. This is as a result of heavy surveillance on the China-Nepal border and Nepal’s extradition policies under Chinese pressure that have led to the deportation of several innocent Tibetans. For India, Tibet has never been a problem. India up until the Chinese invasion in 1950 shared a border with Tibet. Historically, trade, culture and religion linked India to Tibet. More significantly, Tibet got its Buddhist identity from India, and also its written script. In other words, India has been the primary source of Tibetan civilization and identity.That Tibetans are still prepared to make the tough journey to India tells us much about China’s policy on Tibet and its fallout. The presence of Tibetan refugees in India is indicative of two major policy problems in China. First, there is certainly something atrociously wrong about China’s Tibet policy that forces the Tibetans to flee their homeland for safety and wellbeing. Second, that the Tibetans are exiled points to the deeper truth that the Chinese are invaders and Tibet has been occupied. 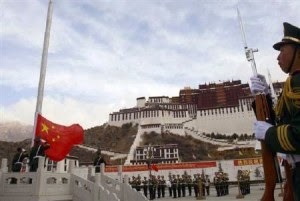 Clearly, the problem of Tibet is China’s creation, and therefore its headache. After 1959, India emerged as the home in exile for numerous Tibetans. India does not see any cultural conflict in allowing the Tibetans to come to India. India’s culture of atithi dev bhav(“guests are gods”) have welcomed refugees through history, be it Afghans, Iranian or Bangladeshis. During the 1971 Bangladesh Independence Movement, 10 million Bangladeshi refugees entered. However, most of the refugees from various countries have gone back home. But China does not want to take back its Tibetan citizens. While in the past the Chinese government disclosed a vague willingness to allow his Holiness the Dalai Lama to return to China, it showed no interest in taking back its citizens exiled in India. It also stopped all meetings with the Tibetan government in exile after 2010 on the sole issue that the Dalai Lama has refused to accept the Chinese position of Tibet as historically a part of China. The Dalai Lama has clearly stated that he cannot lie but is willing to move on without bringing up history. It is ironic that China rakes up history with India and Japan and other countries on contentious territorial issues – in fact, history is the primary irritant in China-Japan relations. Yet, when the Dalai Lama says that he is willing to discuss everything bar the historical status of Tibet, China is averse to it. Clearly, the problem of Tibet is of China’s own making. Its Tibet policy is based on the assumption that with the passing of the Dalai Lama, the Tibetan problem will fizzle out. Such a policy assumption is faulty and trivializes notions of identity. Arguably, the modern idea of Tibet has formed and consolidated primarily under the impact of Chinese policies. From a purely religious and cultural identity until the 1950s, it incrementally acquired a political identity through its struggle against the People’s Republic of China. The 2008 Tibetan protest clearly established the flawed nature of Chinese policies based on integrating Tibetans through economic development. The current spate of self-immolation of Tibetans in Tibet and beyond is testimony to the reality that the situation there is desperate. More significantly, it has exposed the truth that the problems of Tibetans lie within Tibet’s borders, not outside. Yet the Chinese government points a finger for all its problems in Tibet at India and the Tibetan exiled groups. It also fears that India will use the Tibetans as a card in dealing with Beijing. Hence, it addresses the Tibetan issue with India from this fear-psychosis. It scarcely realizes that India, being a civilized state with a strong belief in humanity and pluralism, does not believe in using the Tibetan issue as a card. Also, being a democracy, it cannot curtail the basic rights of the Tibetans in India. Based on its principles, it has welcomed the Dalai Lama in India and values his presence, as this has inevitably allowed India to reclaim its position as the birthplace of Buddhism. Clearly, China needs to correct its perception of Tibet and revisit its Tibet policy. This will certainly create room for removing the misperceptions afflicting India-China relations. NOTE-- Abanti Bhattacharya is Associate Professor in the Department of East Asian Studies at the University of Delhi, India. The above article was initially published on Asia Times Online.